Baroness, who recently announced the release of their fourth album, Purple (Dec. 18, Abraxan Hymns), launch their first U.S. tour in support of the ten-song album with a round of intimate performances beginning Nov. 27 at the Ace of Cups in Columbus, Ohio. In conjunction with the tour announcement, the band have unveiled the official music video for “Chlorine & Wine” via their website (http://www.yourbaroness.com). 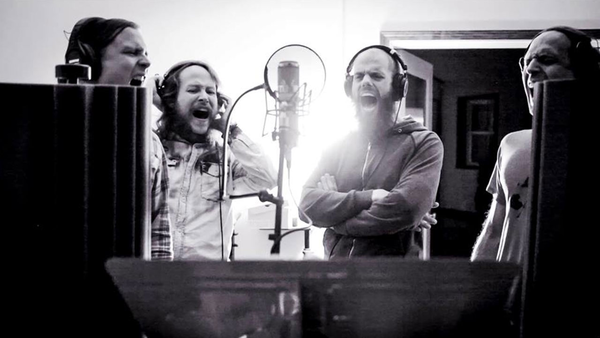 The clip, which was directed by Jimmy Hubbard, gives fans a raw, behind-the-scenes peek into the making of the song, including footage of Baroness writing and rehearsing the track as well as recording at producer Dave Fridmann’s Tarbox Road Studios. A European outing kicked off the band’s live dates in support of Purple, with slots at both the Reading and Leeds Festivals, saw the first live performance of “Chlorine & Wine.” Baroness also joined Metallica for the Sept. 16 opening at the Centre Videotron in Quebec. Dates for the band’s forthcoming U.S. tour are listed below, tickets are on-sale now via http://www.yourbaroness.com/tour. Pre-order packages for Purple, which feature an instant download of “Chlorine & Wine” as well as a limited edition colored vinyl version of the new album, two picture discs, t-shirts and other unique items are available now via this link: http://smarturl.it/dpurple. Digital pre-orders, which also include an instant download of “Chlorine & Wine,” are available via iTunes (http://smarturl.it/ipurple), Amazon (http://smarturl.it/apurple) and Google Play (http://smarturl.it/gpurple). Yellow & Green landed atop most 2012 year-end lists with Entertainment Weekly awarding the release the #1 spot on their best metal albums round-up and saying “’Take My Bones Away’ hit harder and popped sharper than anything on rock radio in a decade. The double album was similarly lauded by Decibel (#2), Pitchfork (#3), Revolver (#4), Village Voice (#6), Spin (#6) and the BBC (#13). Baroness is John Baizley (guitar, vocals), Pete Adams (guitar, vocals), Nick Jost (bass, keyboards) and Sebastian Thomson (drums).